Sorry about the delay in replying, but I do have a life. I do apologise to Puggsley, as I had him confused with another idiot having a whinge. Here's the replay from my side and you will see the time it took for my shot to land. I don't actually aim to shoot enemy tanks that have already died. So now all the other trolls can keep this subject matter off-topic and carry on as they have been. But bob you have not addressed this comment. "I indicated that enemy and my shot was in the air before you raced in trying to try to claim the kill and you paid for that stupidity by taking splash damage. So don't come raving at me when it was your own fault." Your shot was in the air before I got next to him. It had to have been in the air for 10 seconds right? Suggest your timeline and how it fits with me racing in before you shoot. Why is your target indication not showing up in the chat like it always does? Edited by Puggsley, 26 January 2019 - 08:04 AM. Bob, whatever the hell you do, please do not ever decide to do your own legal defense. You are out of your mind if you think this puts the topic to bed. It clearly shows you don't mark the target. The replay supports the timeline I posted. That replay clearly shows you shoot after the TD is dead. You are a muppet. Words fail me. How in the hell do you think this helps you. Understand that you have posted clear and incontrovertible evidence that you do deliberate team damage. And shown yourself to be a total hypocrite. Now everyone knows why you get team killed. Well maybe except for you, maybe you are that lacking in self awareness. In fact I'm submitting this replay with a ticket to WG to show that you flagrantly shoot at your own team. Edited by Puggsley, 26 January 2019 - 08:40 AM. Bob shooting at live tanks...…. "Your Honour, I rest my case...…"
One interesting thing is why the hell is Bob worrying about a tank with zero hit points left when there are 2 lightly armoured enemy tanks sitting in the open for him to shoot. Well I guess they are alive aren't they. And there are no allies next to them. Edited by Puggsley, 26 January 2019 - 09:02 AM. So it seems Bob's position is less unassailable than he thinks, how surprising. Puggsley, I see you don't, or can't, read. I did say that, "I do apologise to Puggsley, as I had him confused with another idiot having a whinge." Meaning ANOTHER idiot, not you. At the time I was intent on doing SUPPORT, not stat-padding damage points. Not to mention that they had only shortly come from behind that hill. You know, if more arty players actually tried to support their team mates, you get a lot less whining, whinging idiots complaining about arty. So if a bit of accidental team damage happens, it's not my intention. But you idiots carry on whining and whinging anyway. I would like to SUPPORT my team kill the dead tank that, even when he was still alive, was not going to be able to do any damage in the first place due to a lack of turret. However, It is not the role of a SUPPORT to stun 2 tanks around a corner which pose an immediate flanking risk to my team's mediums. That's not a SUPPORT thing to do. 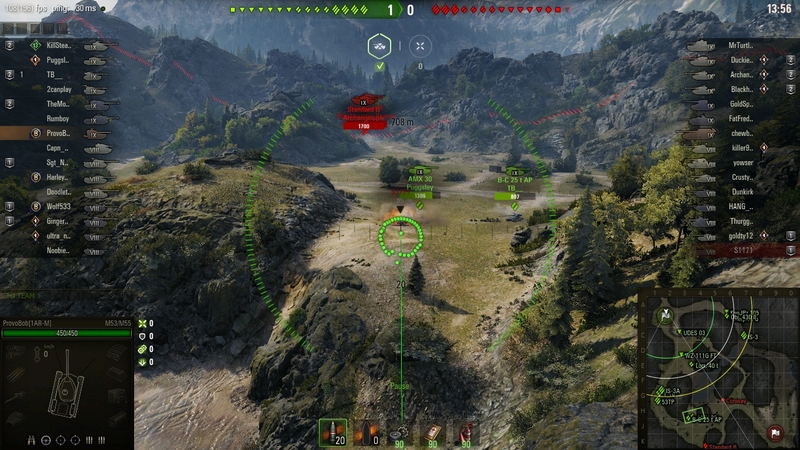 As an Arta Player, SUPPORT means giving my teammates encouragement for flanking TDs by gifting them a HE shell. Edited by MagicalFlyingFox, 26 January 2019 - 11:46 AM. Eh, you can't adjust your gun quickly enough to hit the Std platoon. Those things pop out too quick for arty to dial in; Puggs will take damage from the Std anyway. But you still clicked your gun even though the target's already dead and surrounded by teammates? Slow hands? Edited by mttspiii, 26 January 2019 - 12:01 PM. Eh, you can't adjust your gun quickly enough to hit the Std platoon. No mttspii, its because he doesn't stat-pad damage farm. Can't stat-pad damage farm when you don't do damage to the enemy. But moving your aim in and out with only a small amount of lateral movement means you have pretty much zero bloom. Its just aim along the line you are already on and shoot as soon as the crosshairs are on the target. Ok Bob, I didn't read it that way. Thanks.